Its 2018, fashion and streetwear in some cases has become easy to understand, read and predict. When it comes to streetwear I am easily pleased with its simpler laid back approach because I do like things low key and cozy – the additional tech features and light high fashion details in todays streetwear are a nice touch as well. When we talk about fashion alongside design, things do worry me a bit. For a guy like me whose spent most of his life in streetwear - fashion has always had this element of unknownness, curiosity and some pure „WTF“ moments. Don’t get me wrong, I'm not a student of Central St. Martins or of the Antwerp Fashion Department, I know there is a lot of talent and craziness out there. I am a simple street kid, and my fashion universe definitely is only looking at the surface of things. However, Fashion should still be worried that a simple street guy like me looks at the big fashion houses with no glimpse of surprise or excitement. Aside from Prada, I see a lot of the same stuff happening everywhere, and I keep asking myself when they will stop doing things I can so easily understand ? You can try to copy the Virgil Abloh way but it isn’t that easy – trying to design sneakers and putting some graffiti like writing on an expensive purse is already a little bit outplayed, don’t you think? If I was a fashion fan I would be very excited for one of the big fashion houses to choose from another pool of inspiration, going back to sleek fashion or I would stick only with Kiko Kostantinov. Again, this is not my world, so let a streetwear guy have his opinion about all this, too. So what is this guy talking about fashion while writing his third article about an anti establishment, cult-followed hard to get your hands on company from the dystopia of Downtown Los Angeles you might ask yourself? Because Heightened Sense® is exciting, unpredictable, non-conformist and has this right dose of WTF now and then. Far away from mass production and the very same sameness that we see in all cities all around the globe, Heightened Sense® is providing individuality in small doses that rather seem like prototypes for an Akira-ish future and design world. Each garment is individually cut, sewn, and numbered as limited good in Downtown Los Angeles. Solid the creative mind behind the brand proved his vision many times to me, and I am excited to follow this brand for a long time with Biancissimo. Time to look at their next collection! For this collection Solid again worked with an illustrator to mix character design with his utopian vision of fashion. Artist gang.box created an animated theme to this collection with separate characters wearing highlighted outfits from the collection to set the tone. Artist @t_rexglobal is responsible for South Of Heavens ‘printable’ graphics – visually translating the world of Heightened Sense®. Things are moving forward, and HEIGHTENED SENSE® will collaborate with Bodega's new store in Downtown Los Angeles for the brand's first physical installation build out / release. HEIGHTENED SENSE® is a gem from LA and its time for you to follow or continue to keep looking and get excited. 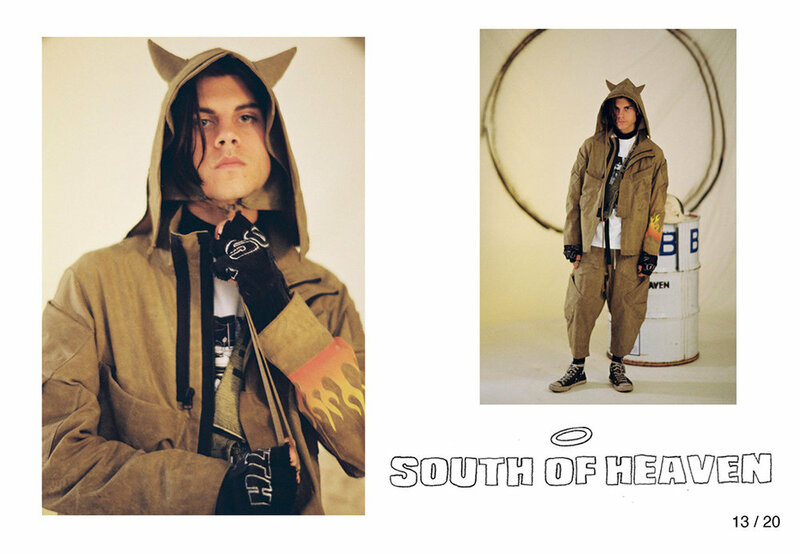 HEIGHTENED SENSE’s latest collection SOUTH OF HEAVEN illustrates garments as abandoned armour or relics of a future-past rather than clothing. The term South of Heaven is a conceptual play on words regarding the human position of seeking perfection in all aspects of design. South Of Heaven uses a variety of dynamic fabrics: water resistant waxed off-white cotton canvas that is subject to extreme ageing effects, ballistic kevlar denim that changes colour over time from UV rays, Dyneema® a revolutionary new fibre 15x stronger than steel, and a waxed cotton stripped of its wax coating followed by an organic black dye and heavy stone wash. HEIGHTENED SENSE® always makes sure to include its fair share of functional features; ranging from a 3-way adjustable coat that seamlessly changes from trench coat > jacket > vest, a garment that transforms from jacket to adjustable messenger bag, and a waxed cotton long-coat with adjustable/removable sleeve lengths. You can RVSP here for their upcoming Bodega event!